This March in Nkuene Ward, Meru County, potatoes were in flower, farmers were busy in their potato farms attending to their precious cash crop. Decentralized seed multipliers also known as Village Potato Advisors (VPAs) are busy too, doing a routine follow-up on farmers’ plots advising them on crop management of at this critical stage. Farm Input Promotions Africa (FIPS-Africa) recruited 72 VPAs in Meru County to catalyze improved productivity and higher returns for potato farmers. The VPAs are supported through the Feed the Future Kenya Accelerated Value Chain Development (AVCD) Program in partnership with the International Potato Center (CIP). Catherine Kirema is one such VPA; she awakes at 5:30 am cleans, cooks and then prepares her children for school. By 8:30 am, Catherine is at the furthest corner of the Katherine village doing what she loves most – offering much needed advice to smallholder potato farmers. ‘I keep close to my farmers encouraging them with advice on how to care for their potato crops. I have a lot to share with them, these visits also help promote my local seed potato multiplier services,’ says Catherine. After her secondary school education, Catherine, 36, has never given up her dream of being stable in life, both socially and economically. ‘Being recruited as a potato multiplier has rekindled my dream of being a successful business woman. It has opened up an avenue to interact with both young and old, they love me,’ says Catherine. Doreen Wanja bought 20 kg of Asante variety from VPA Catherine at KES 30 (USD 0.30) per kg; she planted the clean seed potato in December 2016. ‘I bought this variety because I loved how the one kg promotional pack performed. I harvested 18 kg from the one kg that I received in April last year! I was so impressed that I pre-paid KES 600 (USD 6) for 20 kg. I expect to harvest 300 kg in March 2017,’ says Doreen. 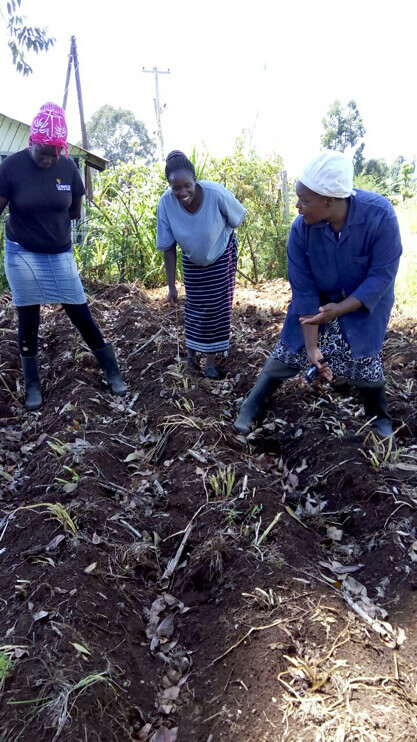 After experimenting with certified seed potato her own plot, she acquired good agronomic practices through practicing and learning by doing. Doreen, like many other farmers in Nkubu Ward, used to buy ware potato from Nkubu market – 30 km away from Karimbene village. At harvest time, the small-holder farmer would then recycle the ware by sorting out the smallest tubers and saving them for seed. Had she planted the same quantity of ware seed potato last season, Doreen would have harvested 180 kg equivalent to an average of3.8 tonnes/ha. Doreen will sell her 300 kg potato harvest as ware and plans to buy fresh seed from the VPA every season. Last season, 11 VPAs in Nkuene Ward sold 7,848 kg of Asante clean seed to smallholder farmers in their villages. VPA Catherine planted 380 kg this season (after saving some of last season’s production) and expects to harvest up to 4,000 kg, equivalent to 40 tonnes/ ha. 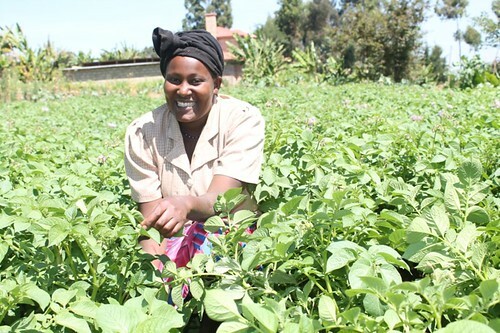 ‘I have now equipped the smallholder farmers with knowledge on good potato agronomy and as a result, they see the returns and now need clean seed potato. I have more than 30 farmers who have pre-ordered for next season, between 30 and 50 kg each!’ Catherine still expects many more farmers to purchase the seed potato. She explains that majority of smallholder farmers in the area purchase seed potato at the last minute just before the planting season. She is confident that all her produce will be bought since demand increases around planting season. ‘I must say ahsante (Swahili word meaning thank you) to the AVCD program; it has changed my life for the better. I am now a business woman selling seed potato,’ shared Catherine. Tags: CIP, Potatoes, VPAs. Bookmark the permalink. we are enrolling to the program at uasin gishu as a group on potato planting.